a rider do in this situation? New York, could use some education. Maybe you can start with me? Larissa’s question refers to an incident in the Protected Bike Lane on lower 1st Ave in Manhattan. These are the bike lanes that run alongside the curb where cars would typically park, while the parking lane is “floated” one lane out toward traffic. Cyclists ride between the parked cars and the sidewalk. I’m so glad you found my site and asked me this question. It comes up a lot and definitely needs to be addressed. Though I’ve given this subject a lot of thought, this is the first time I’ve committed the ideas to paper. Get comfortable, I’ve got a lot to say about dealing with Pedestrians in the Bike Lane! In my seminars, I teach that there are 4 Layers of Safety that we rely on to get us back from each ride without incident. In the case of your pedestrian walk-out incident, it’s clearly a Layer 3 situation. You are a competent rider, you were behaving lawfully and properly, but the mistake of the woman caused you to go down. Suggesting that there are things you could have done to avoid this incident seems a little like “blaming the victim”. But as you may have noticed in the articles on my site, I don’t engage in assigning right and wrong to the actions of road users, even when clear violations may exist. My single-minded goal is to analyze and understand why these conflicts occur so we can discover the best ways to avoid them. With that in mind, let’s talk about how to deal with pedestrians in a “Floated Parking Protected Bike Lane”, and, how the very design of these lanes encourages pedestrian walk-outs. while the parking lane is “floated” one lane out toward traffic. Here’s a stupid movie reference: Did you see the movie “Terminator” where Schwarzenegger’s robotic eye scans everything in his field of view – each object is cyber-analyzed to identify targets, threats, life forms etc. Even if you didn’t see it, you get the idea. When I’m riding in a protected bike lane, I scan each person on the sidewalk to evaluate them for walk-out potential. An elderly person with a shopping cart several feet away is a low threat. But more agile side-walkers carry greater walk-out risk. And those who are walking TOWARD the curb, heads down in their phones present HIGH RISK for walk-outs. The tools we have boil down to: Get their attention and modify our speed. I ring my bell a lot. Bikes are silent and that’s a problem for pedestrians. I want them to hear me coming from a distance and perceive that I’m getting closer. A single PING or BRINGG is often not enough as it doesn’t convey the clues they need to sense that I’m moving toward them. Bringgg-Bringgg! – – Bringgg-BRINGGG! – I ring repeatedly and I watch them for a response. If they look at me, we’re golden and I ride on and scan for the next hazard. But it’s a noisy environment and NY peds are not yet attuned to the sound of a bike bell. If they don’t acknowledge my bell, I’ve got a potential walk-out on my hands, and it’s time to slow down. As I’m braking I will probably call out, loudly but friendly, “Heads UP! Heads UP! HEADS UP!”. Usually this will get their attention, but by now, I’m going much more slowly, even prepared to stop. Because I’ve been monitoring their movement and their attention the entire time, I knew they were coming and have had time to react. Most often they’re startled, apologetic and embarrassed, so I don’t rub it in with an angry reprimand. I just nod, smile, and go on my way. I think of this as a pedestrian education event. But I don’t charge them for the lesson. I said early on that the very design of these lanes encourages pedestrian walk-outs. Here’s why. On streets like we’re all used to, with cars parked against the curb, New York pedestrians get the first few steps off the curb for free. That is, whether the sign says “WALK” or “DON’T WALK”, the pedestrian doesn’t have to think about traffic if he/she stays in the shadow of the parked cars. She HEARS the traffic “out there” and knows the first few steps are clear. On the few avenues that now use Parking Protected Bike Lanes, the sound of traffic is even further away, reinforcing that sense that the first few steps off the curb can be taken without looking up. But surprise! Silent, fast-moving cyclists are approaching, and they’re immediately alongside the curb. It’s hard to fault a pedestrian for not realizing that 1st Ave is different than 3rd Ave, or that Columbus is different than Amsterdam. I’ll ride faster next to an empty sidewalk, but when the sidewalk is filled with a range of people; delivery men, children, dogs, groups of teens, lunch-time crowds (8th Ave), I have to take it down a notch. Along a sidewalk like that, it’s like being in the park, you just have to figure there’s going to be spillover. Compared to standard travel lanes, my speed in a PBL is generally slower! Another consideration is the level of bike activity in the lane. More is good. Less is bad. If I’m the 4th or 5th bike in a fast-moving line, I feel more confident about pedestrians than when I’m a lone cyclist on a cold winter day. In this way, bike lanes truly contribute to our safety – the more cyclists there are, the more others are aware of us. And there’s a subtle dynamic that played out in your situation. As cyclists wait at red lights the bike lanes become empty, momentarily negating the awareness effect I just spoke of. The lead cyclist is most likely to encounter conflicts as they enter the quiet zone at the front of the wave. As the lead cyclist you were the icebreaker, clearing the way for those behind you. THEY SHOULDN’T, BUT THEY WILL! Let me bring all this back to your incident on lower 1st Ave. Given the presence of the woman who was not paying attention, I would have had you calling out to her and riding slowly enough so that if she walked out in front of you, you would have been able to stop without falling or hitting her. Practice your 3rd Layer of Safety “Anticipate the Mistakes of Others” by watching and evaluating pedestrians on the sidewalk. Was this your “fault”? No, it was hers! But in terms of not crashing, it doesn’t matter. Count on them doing this to you, just don’t let it ruin your day. I’m very familiar with 1st Ave along it’s entire length. I use the protected bike lane when I’m riding home from anything in Brooklyn or downtown etc. I take a relaxed approach to a ride in the PBL; I know I’m not going to make as good time as I would in a standard travel lane. Above 23rd St, if I want to get home fast, I use 3rd Ave – no bike lanes of any kind. Just me, my hi-vis vest, and my highest gear! Protected Bike Lanes encourage more cyclists to ride because the lanes separate them from cars. The effect of more cyclists is more awareness and this is a good thing. But riding in a bike lane is not riding in a bubble. Cars make Lefts through these lanes, pedestrians and delivery men make use of this new-found free-space. I do think that cyclists should be politically active, advocate for better enforcement and education of motorists and pedestrians, and don’t forget better behavior from cyclists too. But while we’re waiting, we’ve got to do what we can to reduce conflicts and crashes. Protected bike lanes are a labyrinth of hazards. I’m never more alert than when I’m in a PBL. They’re slower going than riding in a regular traffic lane, and that’s how we have to approach them. Slower. More actively. More socially. We’re shoulder to shoulder with people on the sidewalk who are NOT on their guard, are NOT wearing helmets, and are trying to decide how they feel about all these bike lanes. Go out of your way to be courteous and considerate of their needs. It’s safer for you and better for biking. Thanks so much for sending your story to me Larissa. I find it tremendously stimulating and in responding, I get to organize my thoughts. I hope you’ve found this helpful and I would love to hear from you again. 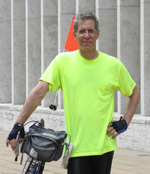 A native New Yorker, biking has been part of my life from my paper route in 5th grade, through my international tours on 4 continents. Now, as a League Certified Instructor (LCI #3507), my focus is on studying and teaching the best way to ride in NYC's unique street environment. I love cycling and I love my city. I believe riding our streets can be stress free when approached with some solid skills, some basic knowledge, and the right frame of mind.